Everyone who wrote letters to Scott Fraser should have received this response. Thank you for writing me in regards to logging on Langley Lake. I’ve spent my career in politics fighting for clean water, sustainable forests, and habitats for wildlife and for future generations of British Columbians to enjoy. For years the former government sacrificed the environment for short term economic gains. This government will make sure any logging on private lands follow regulations set out in the Private Managed Forest Land Act and the Drinking Water Protection Act. I will be meeting with the Union Bay Improvement District to discuss how we protect their drinking water supply. I am also working with the Ministry of Forests, Lands, and Natural Resource Operations on the issue around logging at Langley Lake as well as other private logging operations throughout Vancouver Island. Thank you again for taking the time to write me in regards to logging on Langley Lake. Posted in Government, Kensington Island Properties aka KIP Costanza, 34083 Yukon Inc.
Groundhog Day in The Comox Valley Courtesy of Kensington Island Properties aka 34083 Yukon Inc.
Is it groundhog day? Look who popped up and repeated the old “first step” we’ve heard so many times in the last TWO DECADES. I hope Bruce Jolliffe managed to pry the VP’s fingers off that cheque after the picture was taken! This should be an example to Union Bay landowners the power the CVRD flexed in the revisions to the Master Development Agreement obtaining the $250,000. 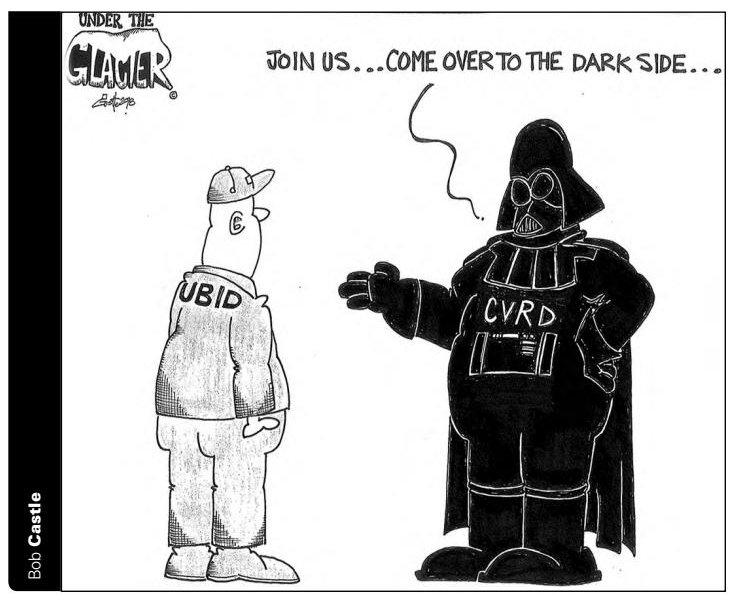 The CVRD got more and when Union Bay Improvement District is negotiating – we get less. Jan. 25, 2018 9:30 a.m. The Comox Valley Regional District’s Homelessness Support Service recently received $250,000 from Kensington Island Properties (KIP) as a community amenity for its proposed development within Union Bay. As part of the development in Union Bay, KIP proposes to construct two golf courses and a mixture of housing and commercial space which could ultimately include approximately 2,889 units once fully built. As part of a recently updated Master Development Agreement (MDA), the developer will dedicate 51.3 hectares of parks and trails, provide a 1.62-hectare lot to the Union Bay Improvement District (UBID) for a new water treatment facility, a one-hectare lot to UBID for construction of a new fire hall as well as 30 affordable housing serviced lots by 2027. KIP will also provide sewage treatment infrastructure for the development which could be expanded to provide wastewater service to some of the surrounding area. The $250,000 provided by KIP will go towards the CVRD Homelessness Supports Service. The funds in that service are allocated to agencies identified by the Comox Valley Coalition to End Homelessness’s five-year plan, which the CVRD board approves on an annual basis. In 2018, the coalition’s five-year plan identified the Comox Valley Transition Society, John Howard Society, Wachiay Friendship Centre/ M’akola Housing and the Habitat for Humanity Vancouver Island North as agencies to receive funding. “The funds contributed in late 2017 by the developer along with 30 serviced single-family lots to be provided by 2027 will provide much-needed support in the full spectrum of housing needs in the Comox Valley,” said Ann MacDonald, the CVRD’s general manager of planning and development. For the record Chair Jacques did not consult with the Board regarding his reply to Mr. Livesey, his response is therefore his own opinion which does not “speak for the Board”. I must emphasize that I am appalled at the tone and content of Chair Jacques’ reply as well I strongly disagree with assertions Chair Jacques makes. It is, in my opinion, both inappropriate and inaccurate for the Chair to unilaterally dismiss the concerns of Mr. Livesey as it is immaterial that he is no longer a land owner, as an elected public servant and elected member of a local government it is our duty to respond to any and all questions and concerns raised by citizens. 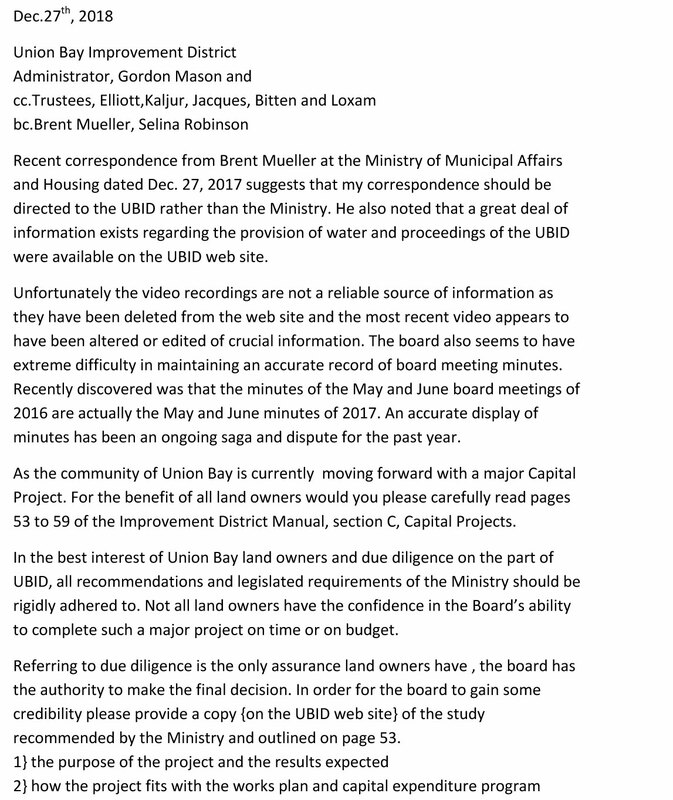 Further the response must be polite, neutral and factually correct, this is specifically required by UBID’s Communication with the Public Policy which should be posted on the Union Bay website, however currently it is missing. Passed in 2008 it is still a valid policy which the Board must adhere to. Based on recent correspondence sent by the Chair and Administrator it seems evident that a review of this policy needs to be undertaken sooner than later. Also missing from the website is any notice regarding the completion of the Land Transfer from KIP to UBID. This transaction was supposed to be completed by December 31, 2017 as per the terms of the signed Potable Water Agreement with KIP October 2017. Therefore Chair Jacques is incorrect when he implies that Mr. Livesey can find this information on UBID’s website. Also incorrectly posted on the UBID website (as Mr. Livesey rightly points out in his letter to the Board) is the May and June 2016 minutes which are in fact the May and June minutes from 2017 not 2016. Our current Administrator has had ongoing issues with posting minutes in a timely and accurate manner. It is alarming that these kinds of errors and omissions (including the recent deletion of 17 minutes of a Board meeting video) are still a regular occurrence. This dismissive response sent by the Chair to a concerned citizen is inappropriate, unfair and inaccurate. I can not in good conscience as landowner and in my ethical responsibility as elected Trustee remain silent on this matter. Re: Your recent email concerning the activities of the Union Bay Improvement District Board. It should be pointed out that you are no longer a Landowner in this community and you certainly are not a member of the present Board of Trustees. 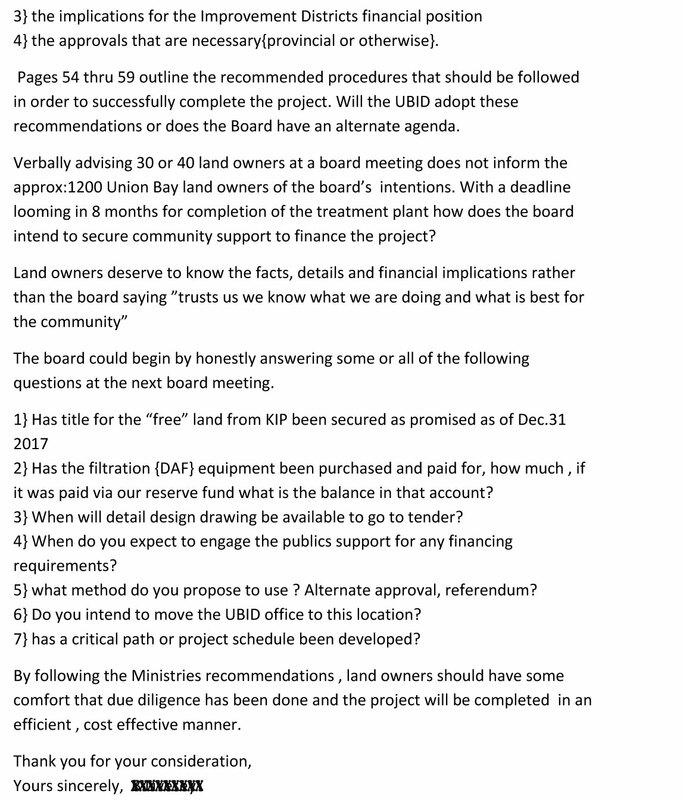 There is no obligation on the part of this Board to accept your comments or queries with any great degree of consideration since you were part of a previous Board that in the opinion of the majority of this Board miserably failed the Landowners of this community. Should you continue to have interest in the points you brought up in your message, then I suggest you monitor our official website from time to time as we continue to move this community forward. Lastly, the website you employed is an in house system designed to distribute information among the present Board members and UBID administration. Consequently any further message received from you by this site will not receive a reply. The original letter sent to all Trustees and Admin – not their spouses! Dysfunctional Union Bay Improvement District and the Mysterious New Motion – Why Are They Afraid of Information? The picture from The Goat shows how few Union Bay landowners show up for these meetings. It’s a good indicator how educated the electorate is when it comes time to cast a ballot. Based on attendance, I’d guess the majority of landowners are clueless. They’re not attending the meetings and the info on the UBID website is sparse at best, so what are they basing their decision on? Morons! Another great article by Scott Strasser of the Comox Valley Record who attended the Jan. 18 meeting and published the following. Thank you Scott for covering matters important to all Union Bay landowners. From left to right: Glenn Loxam, Jim Elliott, Peter Jacques, Gord Mason. Photo by Scott Strasser. Jan. 22, 2018 5:00 p.m.
Union Bay residents interested in learning if their local governing body will eventually convert over to the Comox Valley Regional District will have to wait a little longer. At its November board meeting, UBID had passed a motion to send a letter to the CVRD requesting a study on the pros and cons of joining the regional district as a service area. 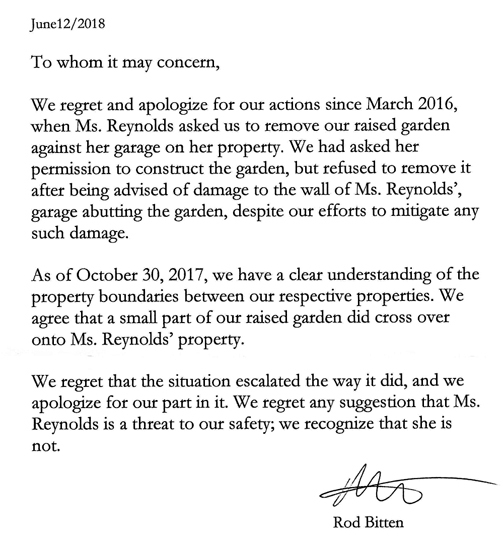 The issue did not come up at the board’s following meeting in December, however, to the chagrin of some gallery members who asked about the letter’s status. But at its board meeting on Jan. 18, UBID approved a new motion to put aside sending that letter and assessing its governance until other priorities are met. After the meeting, UBID chief administrative officer Gord Mason said Union Bay has other focuses on its plate right now, including building a water treatment plant and implementing a new billing system. The improvement district is also involved with trying to prevent impending logging near the shores of Langley Lake — Union Bay’s drinking water source — this summer. Mason said the new motion did not erase the previous one and that he had spoken with Ministry of Municipal Affairs representatives about the community’s possible options for the future. “The ministry stands that the main priority for Union Bay is to provide clean, safe drinking water for the residents,” he said. “When I have the opportunities… we’re going to look at the three options we talked about, which are staying as an improvement district, the possibility of becoming a municipality or merging with the regional district. 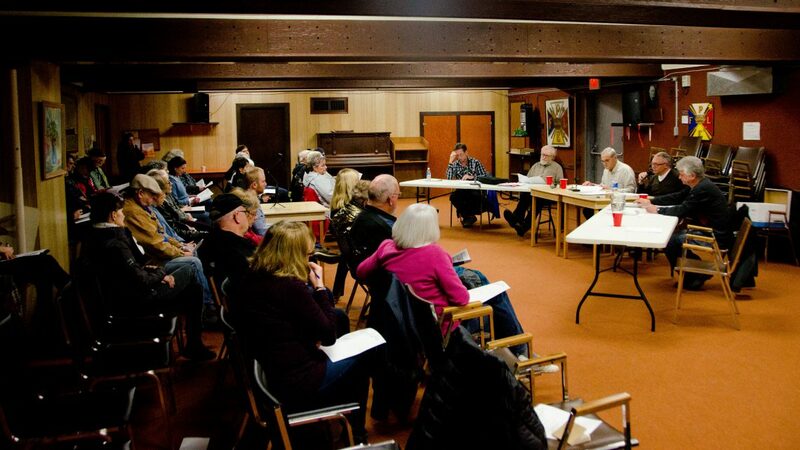 The debate surrounding governance in Union Bay is a longstanding issue. A petition to dissolve UBID and transfer its Letters Patent to the CVRD garnered more than 400 signatures in 2016. UBID ultimately deemed the petition inadmissible due to some of the signees not being Union Bay landowners. If Union Bay were to become a service area, such as the case in Royston or Black Creek, it would essentially dissolve UBID of its responsibilities and transfer its governance over to the CVRD. One concern brought up at the Jan. 18 UBID meeting was that the study on conversion would cost the improvement district money or staff time. Bruce Jolliffe, the CVRD’s Area A director (which includes Union Bay) says that would not be the case. UBID currently provides waterworks, street lighting, and fire protection services to about 1,200 people. Mason said he will be meeting with the CVRD this week to discuss possible options moving forward. Big thank you also goes out to James Wood who attended the Jan. 18 meeting and published the following on The Goat Radio Station My Comox Valley Now. UNION BAY, B.C- Potential logging around a local source of drinking water is causing concern in Union Bay. 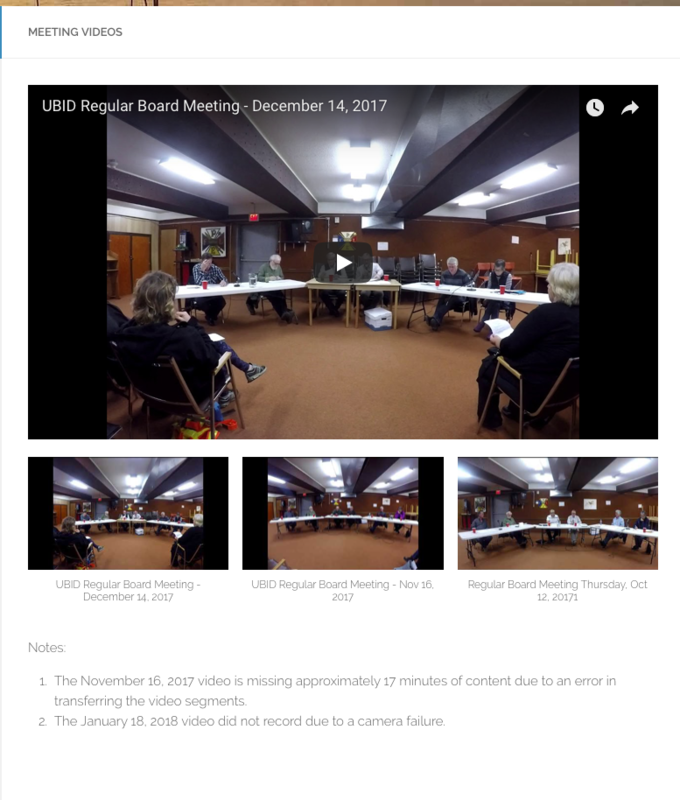 During the Jan. 18 meeting of the Union Bay Improvement District (UBID) trustee board, administrator Gordon Mason delivered a report to the assembled trustees about planned logging near Langley Lake, which serves as the source of drinking water for the residents of the district. Earlier in 2017, the district had been informed that Island Timberlands was planning on conducting logging within 20 metres of the lake’s southwest shoreline. The company owns the land around the lake, while the UBID owns the actual body of water. Trustees and residents have been publicly voicing opposition to the plan, and Mason mentioned discussions between Island Health and the UBID on the subject. During his report, he also stated the UBID had the support of K’ómoks First Nation in trying to get the logging stopped. “We’re working as hard as we can to try and get a buffer zone of land around the lake, so that we can protect Langley Lake and the watershed,” said Mason, after the meeting concluded. He stated the UNID is now working towards getting a meeting with Mid Island-Pacific Rim MLA Scott Fraser on the matter, and a meeting with Island Timberlands is also scheduled towards the end of the month. He did not have the exact date to hand when asked. According to information discussed at the meeting, the company plans to conduct their logging in the fall.